It's not even out of beta, yet Valve Software's Dota 2 is already drawing huge swaths of fans -- enough to trump Bethesda Softwork's blockbuster hit The Elder Scrolls V: Skyrim. Valve Software's Steam service is a pretty neat program. Not only does it allow gamers who prefer playing things with a mouse and keyboard to skip the arduous process of strolling to the nearest GameStop and dealing with insufferable teenaged sales people to pick up a video game, it also features a surprising amount of statistical information on all titles available through the digital distribution service. To wit: This recent graph detailing the number of Steam players simultaneously enjoying The Elder Scrolls V: Skyrim and Dota 2. As you can see, when Skyrim was released on November 11, 2011, the game drew a massive 287,411 simultaneously players. That was the highest number of gamers simultaneously playing any Steam title up to that point, and it stood as the high water mark until March 2, when Dota 2 saw 297,010 players enjoying the strategy title at the same time. If we're going by current playerbase, Dota 2 massively outstrips Skyrim by a factor of 5, though this is less surprising given the latter's relatively archaic age. Still, it's an impressive achievement for Valve's game. On the other hand, maybe this shouldn't be all that shocking. Dota 2 is a Valve Software joint, and Valve is one of the few developers who can always rely on a huge swath of its fanbase to adopt anything it releases (or, as in this case, makes available for public beta testing). 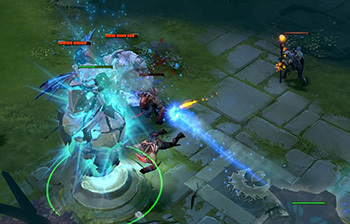 Further, Dota 2 is the most recent entry in the nascent yet mega-popular "Multiplayer Online Battle Arena" subgenre which mutates traditional real-time strategy games into something akin to a squad-based, multiplayer melÃ©e. The subgenre has traditionally been dominated by games like League of Legends and the original DOTA (neÃ© Defense of the Ancients -- a massively popular modification for Blizzard Entertainment's WarCraft III), and since it was first announced, the public has embraced Dota 2 as the heir apparent to the subgenre's crown. We all expected Dota 2 to be successful, but few could have imagined that the game would be breaking records like this even before its official retail debut. The only question that remains is whether Dota 2 can continue to build on its current popularity. Valve is one of the finest developers in existence when it comes to supporting games beyond release, but MOBA games live and die on the strength of their character balance. That aspect of these genre is incredibly difficult to get just right, so it remains to be seen how well Valve can manage Dota 2's ongoing development. Of course, it would probably be both easier and more lucrative for Valve to finally get to work on Half-Life 2: Episode 3, but at this point we may as well suggest that Gabe Newell fund expeditions to capture yetis in the wilderness outside Redmond. Unlike Episode 3 there's a slim chance we might actually see a sasquatch at some point.